Under Henry VIII the power of the throne reached its zenith. Henry VIII made radical changes to the constitution of England, using increasingly repressive means to quell any descent. He is also famous for his six wives – two of which he had executed. Henry VIII was instrumental in splitting the English Church from Rome, cementing the Protestant Reformation in England. His father was Henry VII, and when he died in 1509, Henry was crowned King, aged just 18. In his youth, Henry VIII cut a dashing figure. He had great physical vitality and prowess. He loved hunting and outdoor pursuits. But, he also fancied himself as a poet and a singer. He could be capable of great charisma and good charm, but also his mood could suddenly violently change, and he could turn even on his closest friends. He tended to surround himself with court sycophants who sought to please him at all costs. In 1509, he also married Catherine of Aragon, the widow of his elder brother Arthur. This was a powerful political marriage because of her links with the Spanish Royal family. However, their marriage soured because of her inability to give birth to a male heir – an heir that Henry VIII desperately wanted. Also, during the early years of his reign, he was active in foreign policy. Through his able minister Thomas Wolsey, he fought both the Scottish and French. Initially, these were successful, but the French campaign became increasingly bitter and costly – a war which proved a great drain on the nation’s finances. Henry VIII turned on his minister Wolsey when he failed to persuade the Pope to grant an annulment of his marriage to Catherine. Henry decided to go ahead with the divorce anyway. With the help of Thomas Cromwell, his new right-hand man, he had his first marriage annulled and married his new love – Anne Boleyn. 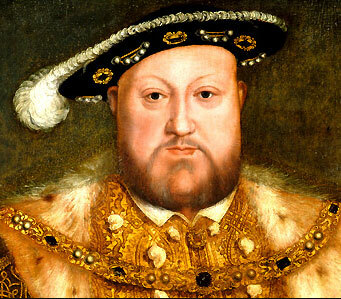 The divorce meant Henry VIII was excommunicated from the Roman Catholic Church. But, Henry did not mind and just announced himself head of the Church of England. He also demanded the clergy declare the loyalty to him and not the pope. Following on from this he launched a brutal assault on the church and the dissolution of the monasteries which were a means to raid the Church’s coffers for the benefit of his treasury. Anne Boleyn had one child – the future Queen Elizabeth I, but then suffered three miscarriages. Henry’s infatuation with Anne Boleyn soon changed, and he started to blame her for failing to produce a male heir. He started courting Anne Seymour and to get rid of Anne Boleyn, he requested court fixers to have her framed for adultery and high treason. Along with five other men she was supposed to have had an affair with, she was executed on Henry VIII’s orders. Henry VIII then married Anne Seymour – who bore Henry VIII a child (the future Edward VI and his only male heir), but she died in childbirth. Henry really mourned for Anne’s death and always looked upon her as his true wife. His fourth wife Anne of Cleaves was a disaster. Henry had been led to believe she was very attractive but on arrival at the court, he was repelled by her appearance, and so after a few weeks the marriage was annulled. His fifth marriage was to Catherine Howard who was later beheaded for adultery in 1542. His sixth wife was Catherine Parr, the marriage was relatively smooth, and she survived him. In his final years, Henry’s physical condition rapidly deteriorated due to unhealthy diet and a nasty fall while hunting. He died in 1547. Citation: Pettinger, Tejvan. 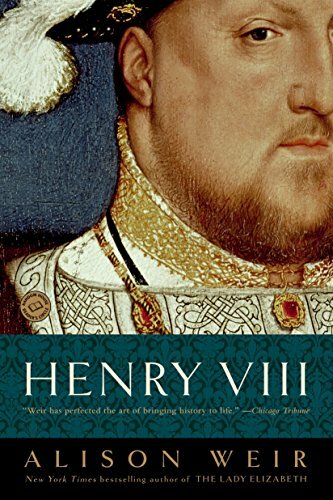 “Biography of Henry VIII”, Oxford, UK – www.biographyonline.net. Published 17th January 2010.